Hey, everyone! 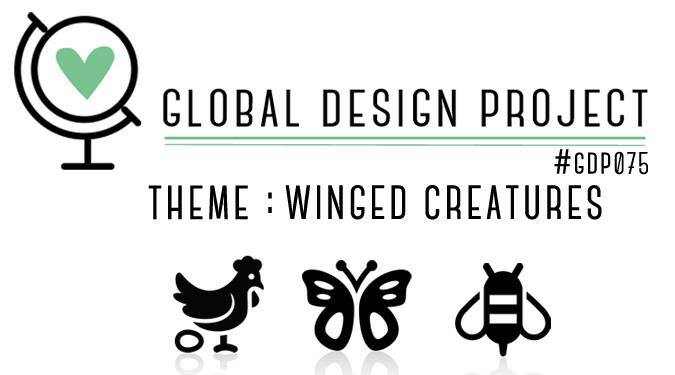 I’ve gone waaaaaaaay out of my comfort zone today to play along with the Global Design Project challenge, which is to use any winged creature on a card. The winged creature isn’t out of my comfort zone, but I chose colors that I don’t usually go for. I had a vision for this card. I really wanted to push myself to use NO brights and NONE of my signature colors (kill me now, please, and pass the Bermuda Bay) but still make a card that reflects a little of my style, whatever that is. My first version used a Soft Suede card base and Soft Suede ink with a Crumb Cake stitched circle. It came out okay, but I didn’t like how the sentiment looked, and the card was all brown and sad. So I decided to try different colors. I love this with the Sahara Sand and Night of Navy. 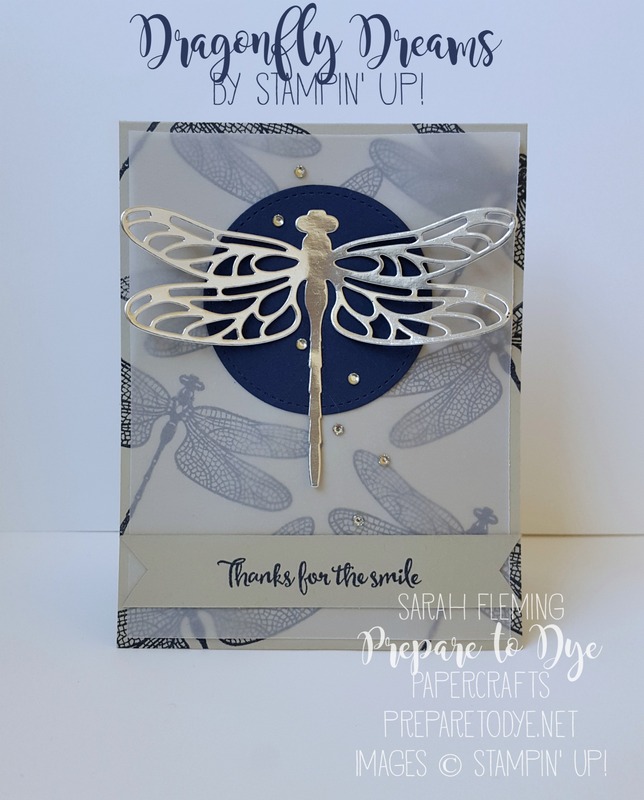 The Silver Foil dragonfly is not so overwhelmed by brown-ness. 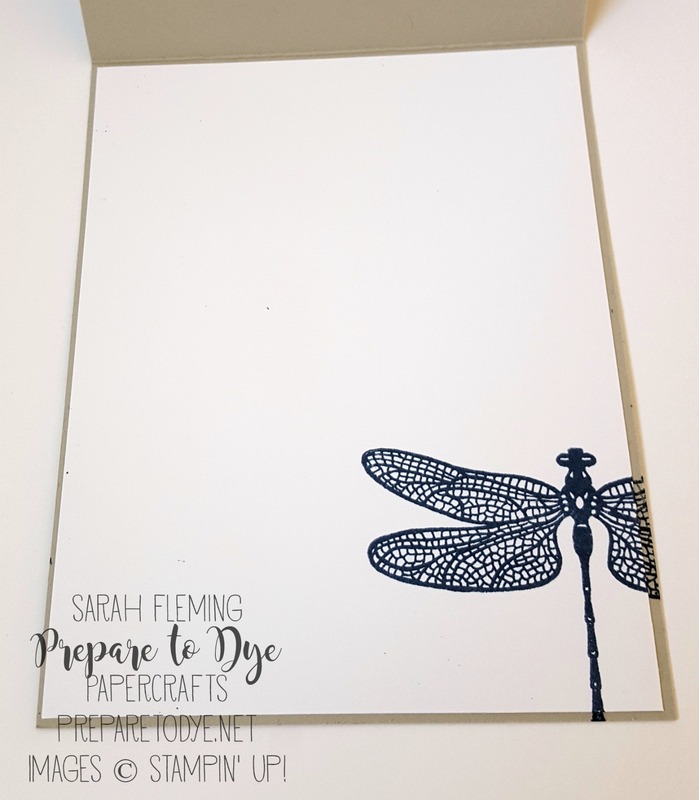 The dragonfly and the spray of Rhinestones are Very Sarah, so that’s how I was able to keep myself from adding a little Melon Mambo. *That dragonfly, y’all. 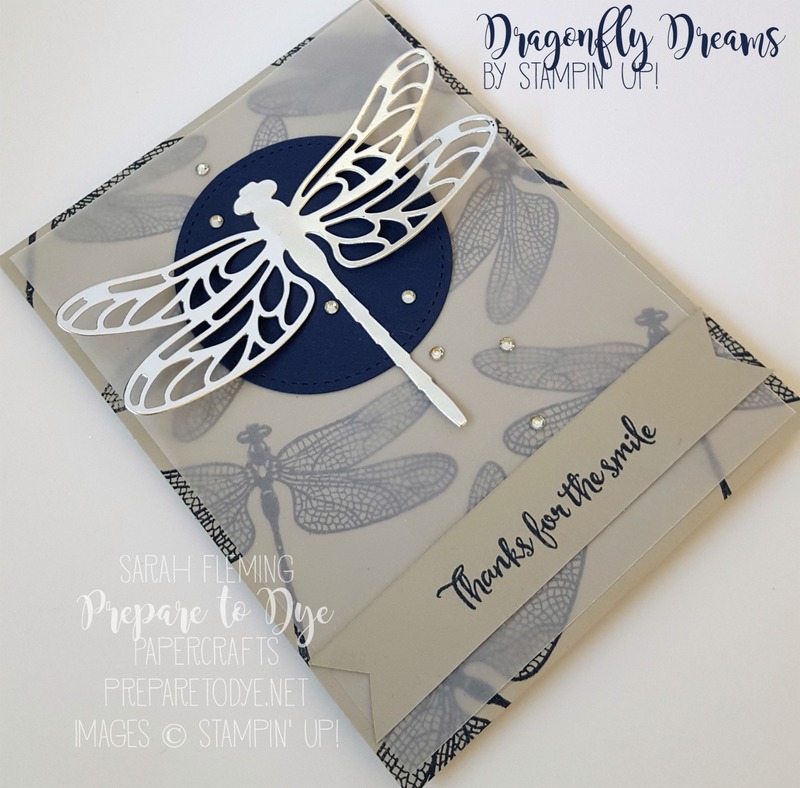 The detailed dragonfly stamps are so beautiful that I often overlook this giant dragonfly die. It does all the work for you to make a gorgeous card. *The Stitched Shapes circle is the 2nd largest circle in the set. The largest circle kind of overwhelms the dragonfly, but this size is a perfect backdrop. *I love to make my own backgrounds by repeatedly stamping images. 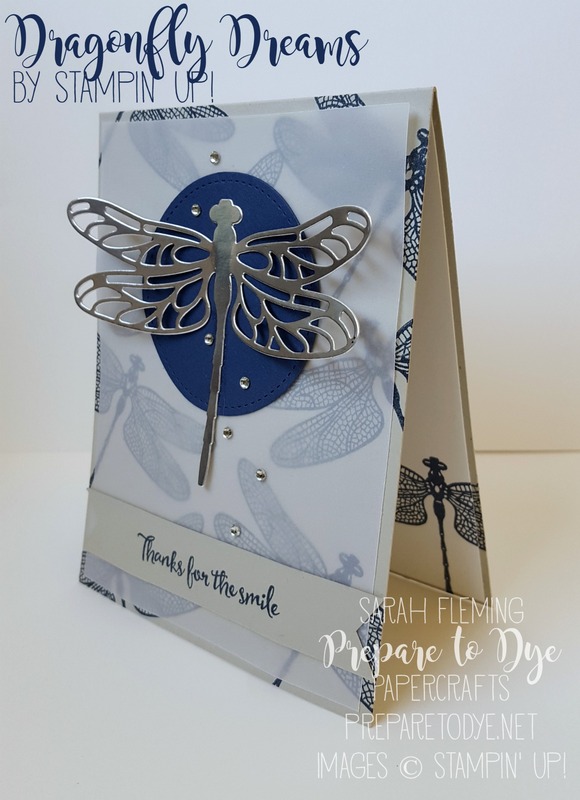 The detailed dragonfly stamp makes a lovely background. *The vellum is glued down only behind the Night of Navy circle and the sentiment banner so the glue doesn’t show. 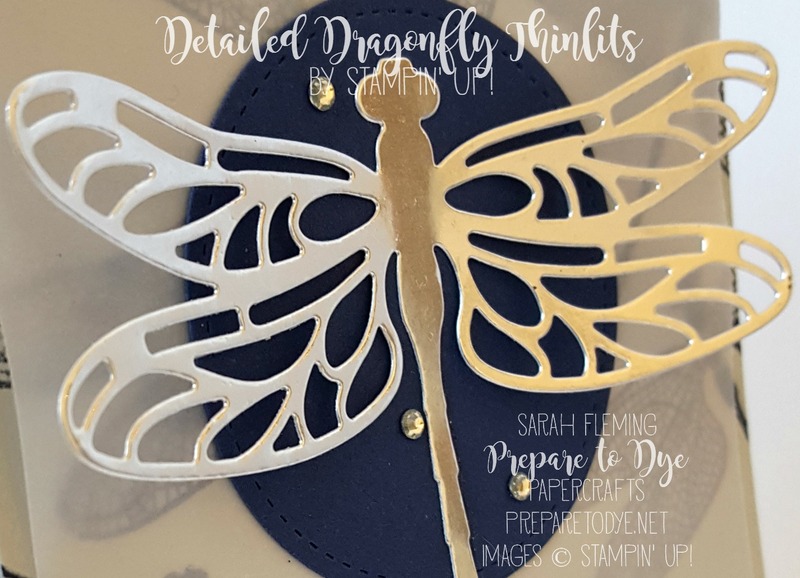 Having two different areas glued down helps to feature the background dragonflies a little more, too. *The sentiment is actually from a two-line stamp that says, “Thanks for the smile and everything else.” I covered the “and everything else” with washi tape before inking the stamp, then removed the washi tape before stamping. *I hand-cut the flagged ends of the banner with my Snips. You were out of your comfort zone??? This is amazing Sarah! Love the vellum layer to soften everything and that trail of rhinestones is perfection. Beautiful! Thanks so much for taking part in this week’s Global Design Project.